My kids are obsessed with chopsticks. It all started with pho (which my son refers to as ‘noodle soup’). They were so cute trying to figure out the little wooden chopsticks that I ended up buying them each some super sweet (both awwww sweet and awesome sweet) animal chopsticks – panda for the girl child and monkey for the boy. 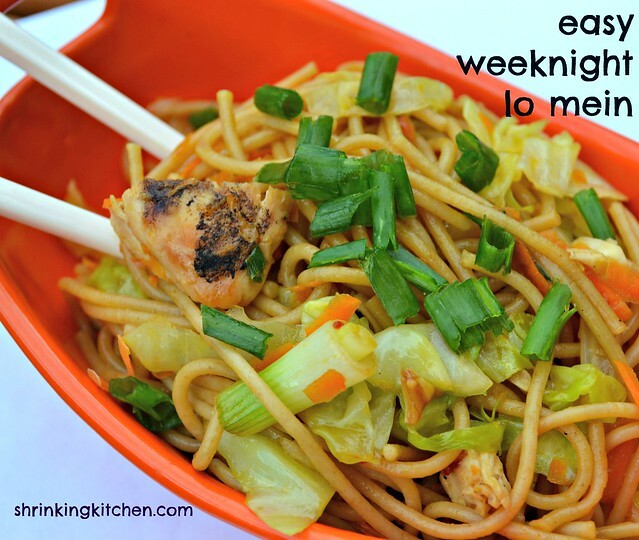 One chopstick friendly dish they hadn’t tried was lo mein. We don’t order a lot of Chinese because honestly, I can’t control myself around the stuff. I catch a whiff of egg rolls and fried rice and sweet and sour chicken and I’m done. I wake up two hours later with a stomachache, greasy hands and a very guilty conscience. And hungry again (sorry, bad joke – but I had to). But there’s no reason I can’t make takeout at home, healthier. So decided that lo mein was something I needed to healthify. My version uses whole wheat noodles, lean chicken and tons of cabbage and carrot. I tried to keep the ingredient list short. After all, this is a pantry meal, a go-to meal, an easy fix. And hand to God, I found all the ingredients for this dish lurking in my pantry, freezer or fridge. Feel free to change up the veggies – celery would work, as would mushrooms or even thinly sliced peppers. And don’t forget the chopsticks! P.S. My kids LOVED it. As evidenced above. Prepare the spaghetti noodles according to package directions. Drain and set aside. 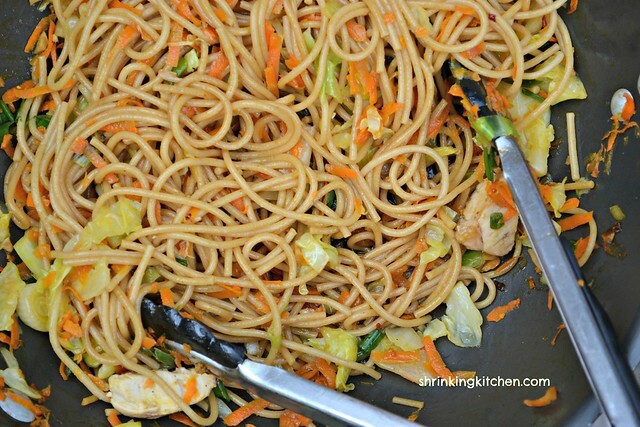 While your noodles are cooking, whisk all the ingredients for the sauce in a small pan. Let it cook till it thickens a bit. Now, the rest of this will move fast. Make sure all your ingredients are ready to go. Okay? Here we go. Heat the oil in a large skillet or wok over medium heat. Add the cabbage and carrots. Stir it or flip it all fancy in the wok if you know how. Continue cooking the veggies for a few minutes, till tender crisp. Throw in the chicken and noodles and toss to combine. Pour the sauce over the top and use tongs to move the ingredients around to make sure they all get coated in sauce. You also want to make sure everything gets heated through. This will take a couple minutes. Make sure you keep moving everything around so it doesn't burn. Remove from heat and serve! Top with some extra green onions or sesame seeds if you like! 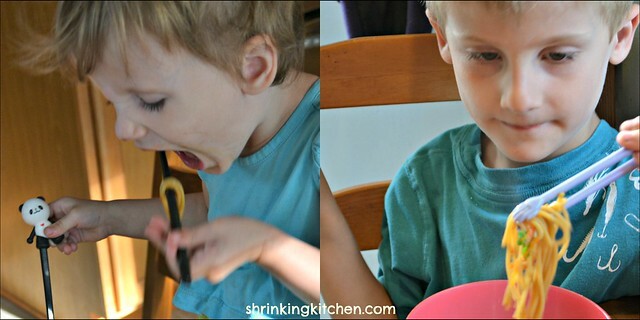 Recipe inspired by Can You Stay For Dinner? Yum! Bet my toddler would live this. can’t wait to try out your sauce. always looking for a way to change up our stirfry/lo-mein gigs. thanks! Yum! I just wish I had a prep cook to get everything ready for me to cook!